Index Funds are Mutual Fund Schemes that are created using the market index as a base. A portfolio of index fund contains stocks in the similar proportion of index. In other word Index Fund follows specific Index. The performance of these funds is dependent on the performance of a specific index. These types of funds are passive fund. They do not require active management. It clearly means that the expense ratio of these funds is very low. For example, SBI Nifty Index Fund-Direct Plan has an expense ratio of 0.25%. It is very low compared to all other actively managed funds. 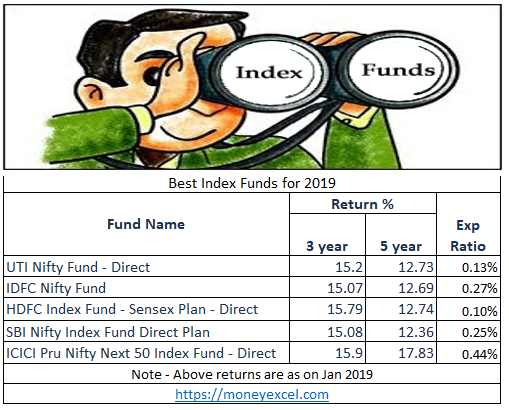 In this post, I will share complete information about Index Fund including “Best Index Funds in India 2019”. Index Funds are mutual funds that emulate the portfolio of an index. Suppose index fund is tracking benchmark index Nifty, in that case, a portfolio of this fund contains 50 stocks of Nifty in the similar proportion. The index fund replicates benchmark index performance. These funds are also known as index-tied or index-tracked mutual funds. There are multiple benefits for investing in Index Funds. Few of them are given below. The influence of the fund manager in these types of funds is very less. It removes the real risk of fund manager error. Funds are passively managed and tracking to specific index is only required by the fund manager. The expense associated with these types of funds is very low. The main reason is these types of funds eliminates the requirement of a dedicated team of research analyst to carry out stock analysis. The fund has to simply replicate the index, so expense ratio of these funds is very low. The lower expenses lead to a better return. As the index is made up of multiple funds, these funds are well diversified in nature. Asset allocation is managed automatically. It indirectly reduces the risk associated with these funds. There are multiple types of Index Funds. Index Plus Funds – Invest in Index stocks and partially in actively managed assets. How to Select Index Fund for Investment? There are various qualitative and quantitative parameters for the selection of index fund. The steps suggested for the selection of Best Index Funds are given below. The first step is identification of index (Sensex, Nifty) suitable as per your risk appetite. You should see stock where investment is made by the index. You should also look at the tracking error. Lower the tracking error better is the index fund. It is a parameter that reflects an ability of a fund to replicate the performance of the benchmark index. Performance of fund is another important parameter. You should compare the performance of the fund with a benchmark index to get an actual idea. Apart from that peer comparison is also important. Expense ratio is another important factor for the selection. The expense ratio of the index fund should be low. You should avoid the fund which unnecessarily charge higher administration and other expenses. On the other hand please don’t select fund only on the basis of expense ratio. Why should you invest in Index Fund? Investment decision in index fund is purely depended on risk appetite and financial goal. However, these types of funds are suitable for investors with the following characteristics. These funds are made to replicate the return of an index. If you are looking for higher return compared to index you should avoid index funds. The disadvantage of these funds is chance of the outperformance is low. If you are planning to invest in Index fund, it is recommended to go for Index plus fund. « How your Family can Help you to Save Taxes?